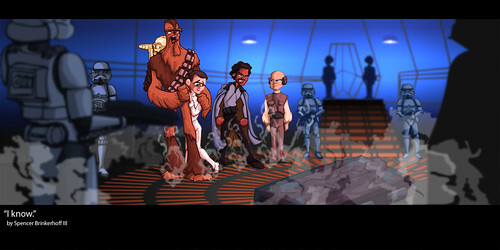 I am so very pleased to announce that the pre-order for my new Star Wars print is online now. Â So to re-cap, there were 250 prints made for my first print which debuted at Celebration Japan. Â They cost around $50/print. Â There are only going to be 100 prints made for this print selling at $100/print. Â Since they were pre-selling some of the prints at the Comic-Con they didn’t put the full amount up to order online. Â Last Friday the online pre-order went live and the adjusted available online total was at 58 prints. Â Current online total is at 35 prints available. Â We have to pre-sell 50 of the prints to get the whole edition made and it looks like we’re about half way there! Â So go over toÂ AcmeÂ and buy a print!